A team of astronomers, including Heino Falcke (Radboud University Nijmegen/ ASTRON) and Adam Deller (ASTRON), has discovered radio pulses from a neutron star practically next door to the supermassive black hole which resides at the center of the Milky Way. Radio ‘pulsars’ are rapidly spinning neutron stars, ubiquitous in the rest of the Milky Way but until now perplexingly unseen in the Galactic Center region. By studying the pulsar emission, the team was able to show that the matter being gobbled by the supermassive black hole is pervaded by a magnetic field strong enough to regulate the black hole’s feeding habits and to explain its radio and X-ray glow. The discovery of a pulsar closely orbiting the candidate supermassive black hole at the center of the Milky Way (called Sagittarius A*, or Sgr A* in short) has been one of the main aims of pulsar astronomers for the last 20 years. 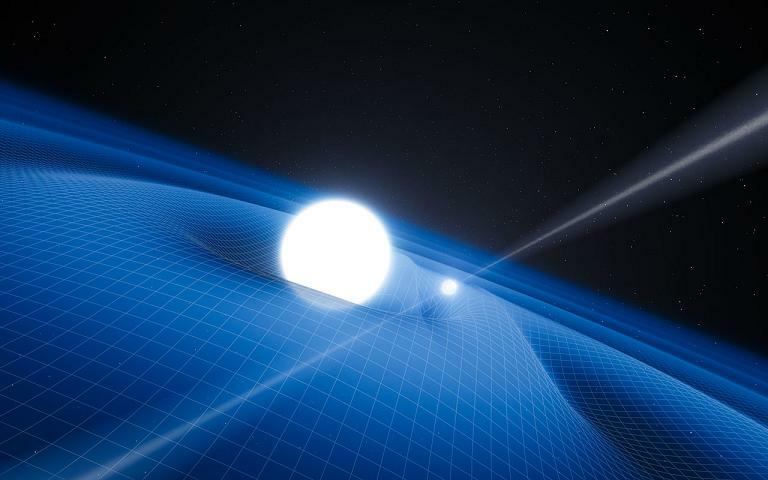 Pulsars act as extremely precise cosmic clocks, and a pulsar near Sgr A* could be used to measure the properties of space and time in strong gravitational fields, and to see if Einstein’s theory of General Relativity could hold up to the strictest tests. The young ultramagnetic pulsar PSR J1745-2900 was discovered when the Swift satellite observed a strong X-ray flash originating very close to the center of the Milky Way – likely less than 1 light-year from Sgr A* – and the subsequent observations showing a rotation period of 3.76 seconds by NASA’s NuSTAR telescope. With the 100m-telescope in Effelsberg near Bonn, Germany, the team discovered radio pulses from the same region with the same period. Additional observations were made in parallel and thereafter with the Jodrell Bank, Nancay and Very Large Array radio telescopes worldwide, while other groups studied PSR J1745-2900 using the ATCA, Parkes and Green Bank telescopes; the ATCA results appear in this week’s journal of MNRAS (Shannon & Johnston). Sgr A* is slowly swallowing the hot, ionized gas which surrounds it – a process called accretion. The accreted gas is also threaded by magnetic fields, which are dragged along with the gas and interact with the accretion process in a complicated fashion, regulating the amount of material accreted and potentially launching powerful plasma jets. Until now, the strength of these fields was very uncertain, hampering efforts to understand the accretion process. The radio pulses from PSR J1745-2900 are strongly polarized; much of the emitted radiation oscillates in a preferred plane. However, as the radiation traverses the magnetized material surrounding Sgr A*, the ‘Faraday effect’ changes the plane of polarization in a manner dependent on the wavelength of the radiation and the strength of the magnetic field. By observing PSR J1745-2900, the team were able to characterize the strength of the magnetic field in the immediate vicinity of Sgr A*. ‘It is amazing how much information we can extract from this single object’, said Deller. Astronomers predict that there should be thousands of pulsars around the center of the Milky Way. Despite that, PSR J1745-2900 is the first pulsar discovered there. ‘Astronomers have searched for decades for a pulsar around the central black hole in our galaxy, without success. This discovery is an enormous breakthrough, but it remains a mystery why it has taken so long to find a pulsar there’, says Falcke. This pulsar is too magnetically active and just a little too far away from the black hole to measure the subtle effects of Einstein’s General Relativity theory with great accuracy. However, with old pulsars, that are closer to the black hole and have a less variable rotation period, the theory can be tested. ‘If there is a young pulsar, there should also be many older ones; we just have to find them’, agrees M. Kramer, director at the Max Planck Institute in Bonn which operates the Effelsberg telescope. Additional high angular resolution follow-up observations of PSR J1745-2900 are now being undertaken to map its orbit around the super massive black hole. From this, scientists can determine the origin of the pulsar and, potentially, refine the estimate of the mass of the black hole. The article “A strong magnetic field around the supermassive black hole at the centre of the Galaxy” has been published in the journal Nature on August 14, 2013 (R.P. Eatough et al.). NGC 2060 is an open star cluster, located about 170,000 light-years away close to the center of the Tarantula Nebula, a vast star-forming cloud of gas and dust in our neighboring galaxy, the Large Magellanic Cloud, in the southern constellation of Dorado. This loose collection of stars is no longer gravitationally bound to each other. The stellar grouping will disperse in a few million years. 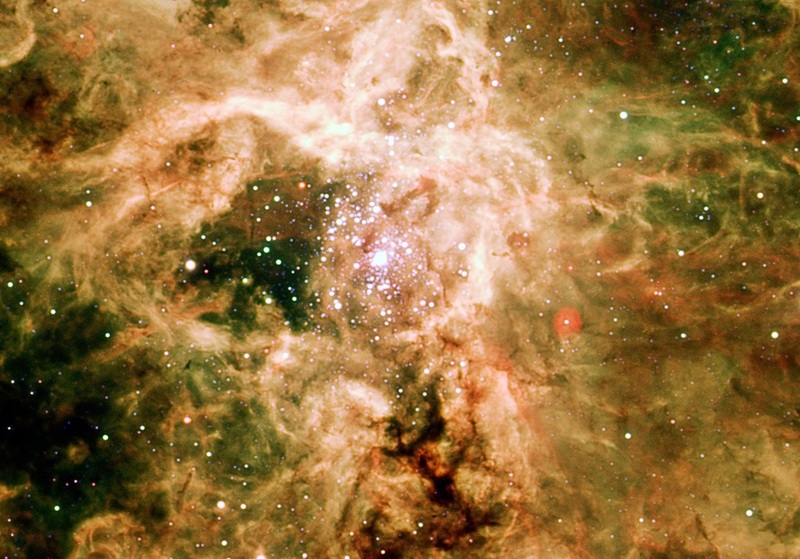 The cluster contains a supernova remnant of about 156 light-years across that has been given the same designation (NGC 2060, although it is also known as N157B, 30 Doradus B or ESO 57-EN1), that is formed by a supernova explosion some 5,000 – 10,000 years ago, blowing heated matter out into the surrounding space at great speed. The dark region below the cluster is a dense cloud of dust lying in front of the supernova remnant. A supernova occurs when a star explodes in the final phase of its life. The exploding star can become billions of times as bright as the Sun before gradually fading from view. Supernova explosions are enriching the intergalactic gas with heavy chemical elements like oxygen, iron and silicon, necessary to build new generations of stars and planets, and to create life. After some supernova explosions, when a massive star – more than 8 and below about 25 solar masses – collapses and becomes so dense that protons and electrons squish together to form neutrons, there remains a small, ultra-dense neutron star. Rapidly rotating, highly magnetized neutron stars are called pulsars. (Above this mass, the star collapses to form a black hole.) The explosion throws an expanding cloud of dust and hot gas into space surrounding the neutron star. When this slams into the existing interstellar medium, it heats up so much it glows in X-rays. In 1998, an ultrafast pulsar (named PSR J0537-6910) was discovered – in X-rays – in NGC 2060 with the rotation period of 18 millisecond. This means that it is one of the fastest spinning pulsars in a supernova remnant. Image Credit: NASA/CXC/SAO/P.Slane, et al. PSR B1509-58 (B1509 for short) is a 1700 years old pulsar that lies about 17,000 light-years away from Earth in the southern constellation of Circinus (the Compass). It is surrounded by an X-ray nebula that spans about 150 light-years, and is associated with the supernova remnant 320.4-1.2. Rapidly rotating, highly magnetized neutron stars are called pulsars. The explosion throws a large cloud of dust and hot gas into space surrounding the neutron star. When this slams into the interstellar medium, it heats up so much it glows in X-rays. Responsible for this remarkable pulsar wind nebula is the small, blueish-white pulsar in the center. This pulsar, B1509, is only twelve miles (less than 20 kilometers) in diameter, and rotates at a blazing speed of seven times per second. It is spewing a wind of charged particles out into the space around it at a prodigious rate, presumably because it has an intense magnetic field at its surface, estimated to be 15 trillion times stronger than the Earth’s magnetic field. The combination of rapid rotation and ultra-strong magnetic field makes B1509 one of the most powerful electromagnetic generators in our Milky Way galaxy. This generator drives the energetic wind of electrons and ions away from the neutron star. 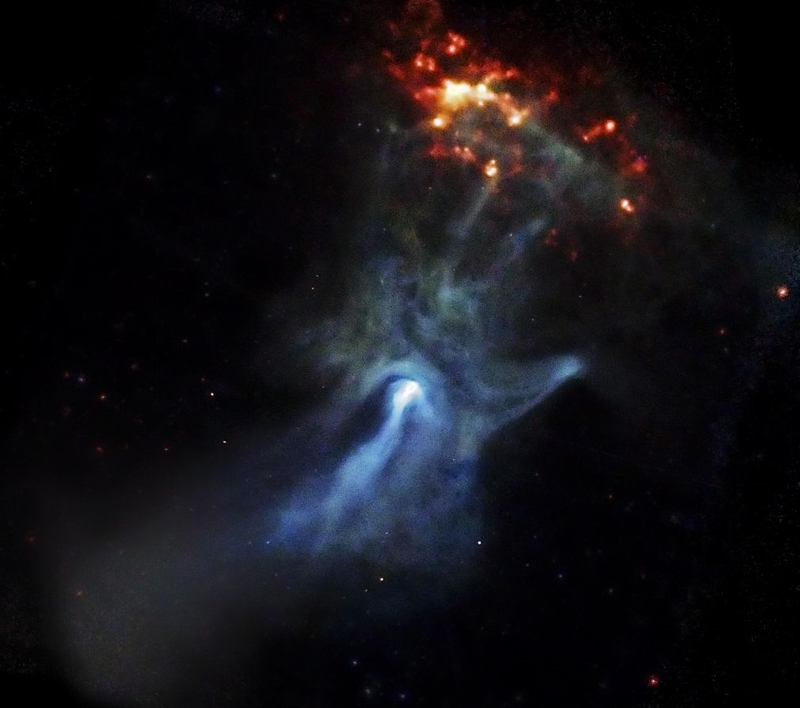 As the electrons move through the magnetized nebula, they radiate away their energy and create the complex and intriguing structure that resembles a large cosmic hand. In the innermost regions, a faint circle surrounds the pulsar, and marks the spot where the wind is rapidly decelerated by the slowly expanding nebula. Finger-like structures extend to the north, apparently energizing knots of material in a neighboring gas cloud known as RCW 89. The transfer of energy from the wind to these knots makes them glow brightly in X-rays (orange and red features to the upper right). The temperature in this region appears to vary in a circular pattern around this ring of emission, suggesting that the pulsar may be precessing like a spinning top and sweeping an energizing beam around the gas in RCW 89. The data for this image, taken with Chandra’s X-ray Observatory, were obtained in a total of 52 hours between 12/28/2004 and 10/18/2005. The lowest energy X-rays that Chandra detects are red, the medium range is green, and the most energetic ones are colored blue. Astronomers have used ESO’s Very Large Telescope, along with radio telescopes around the world, to find and study a bizarre stellar pair consisting of the most massive neutron star confirmed so far, orbited by a white dwarf star. This strange new binary system allows tests of Einstein’s theory of gravity — general relativity — in ways that were not possible up to now. So far the new observations exactly agree with the predictions from general relativity and are inconsistent with some alternative theories. The results are published in the journal Science on 26 April 2013. An international team has discovered an exotic double object that consists of a tiny, but unusually heavy neutron star that spins 25 times each second, orbited every two and a half hours by a white dwarf star. The neutron star is a pulsar that is giving off radio waves that can be picked up on Earth by radio telescopes. Although this unusual pair is very interesting in its own right it is also a unique laboratory for testing the limits of physical theories. This pulsar is named PSR J0348+0432 and is the remains of a supernova explosion. It is twice as heavy as the Sun, but just 20 kilometers across. The gravity at its surface is more than 300 billion times stronger than that on Earth and at its center every sugar-cubed-sized volume has more than one billion tonnes of matter squeezed into it. Its companion white dwarf star is only slightly less exotic; it is the glowing remains of a much lighter star that has lost its atmosphere and is slowly cooling. Einstein’s general theory of relativity, which explains gravity as a consequence of the curvature of space-time created by the presence of mass and energy, has withstood all tests since it was first published almost a century ago. But it cannot be the final explanation and must ultimately break down . Physicists have devised other theories of gravity that make different predictions from general relativity. For some of these alternatives, these differences would only show up in extremely strong gravitational fields that cannot be found in the Solar System. In terms of gravity, PSR J0348+0432 is a truly extreme object, even compared to the other pulsars that have been used in high precision tests of Einstein’s general relativity . In such strong gravitational fields small increases in the mass can lead to large changes in the space-time around such objects. Up to now astronomers had no idea what would happen in the presence of such a massive neutron star as PSR J0348+0432. It offers the unique opportunity to push tests into new territory. The team combined Very Large Telescope observations of the white dwarf with very precise timing of the pulsar from radio telescopes . Such a close binary radiates gravitational waves and loses energy. This causes the orbital period to change very slightly and the predictions for this change from general relativity and other competing theories are different. “Our radio observations were so precise that we have already been able to measure a change in the orbital period of 8 millionths of a second per year, exactly what Einstein’s theory predicts,” states Paulo Freire, another team member. This is just the start of detailed studies of this unique object and astronomers will be using it to test general relativity to ever greater precision as time goes on. This research was presented in a paper “A Massive Pulsar in a Compact Relativistic Orbit”, by John Antoniadis et al., published in the journal Science on 26 April 2013. General relativity is not consistent with the other great theory of twentieth century physics, quantum mechanics. It also predicts singularities under some circumstances, where some quantities tend to infinity, such as the center of a black hole. The first binary pulsar, PSR B1913+16, was discovered by Joseph Hooton Taylor, Jr. and Russell Hulse, for which they won the 1993 Nobel Prize in Physics. They accurately measured the changes in the properties of this remarkable object and showed that they were precisely consistent with the gravitational radiation energy losses predicted by general relativity. This work made use of data from the Effelsberg, Arecibo and Green Bank radio telescopes as well as the ESO Very Large Telescope and the William Herschel Telescope optical telescopes. An international team – led by Dutch astronomers (SRON, NOVA and ASTRON) – has made a tantalizing discovery about the way pulsars emit radiation. The emission of X-rays and radio waves by these pulsating neutron stars is able to change dramatically in seconds, simultaneously, in a way that cannot be explained with current theory. It suggests a quick change of the entire magnetosphere. In their research the team combined observations from the X-ray space telescope XMM-Newton and the radio telescope LOFAR (among others); the research results appeared in the journal Science yesterday. Pulsars are small spinning stars about 20 km in diameter -the size of a small city – with a mass that roughly compares to the mass of our Sun. They have a strong magnetic field that is approximately one million times stronger than the fields scientists can make in laboratories on Earth. The pulsar emits a beam of radiation. As the star spins and the radio beam sweeps repeatedly over Earth we detect a short pulse of radiation, a bit like a lighthouse. Some pulsars emit radiation across the entire electromagnetic spectrum, including both X-ray and radio wavelengths. Although pulsars were discovered more than 40 years ago the exact mechanism by which pulsars shine is still unknown. It has been known for some time that some radio pulsars flip their behaviour between two (or even more) states, changing the pattern and intensity of their radio pulses. The moment of flip is both unpredictable and sudden (often within a single rotation period). It is also known from satellite-borne telescopes that a handful of radio pulsars can also be detected at X-ray frequencies. However, the X-ray signal is so weak that nothing is known of its variability – could it be that the X-rays also flip? The scientists studied a particular pulsar called PSR B0943+10, one of the first pulsars discovered. The pulses from PSR B0943 + 10 change in form and brightness every few hours, and these changes happen within about a second. It is as if the pulsar has two distinct personalities. As PSR B0943+10 is one of the few pulsars also known to emit X-ray radiation, knowing how this pulsar behaved in X-rays during the ‘radio changes’ could provide new insight into the nature of the emission process. The results were totally surprising. The X-rays did indeed change their behavior synchronously with the radio emission, as might have been expected. But in the state where the radio signal is strong and the pulses are clear, the X-rays were weak. And when the radio emission switched to weak the X-rays intensified. “To our surprise we found that when the brightness of the radio emission decreased to half the original brightness, the X-ray emission brightened by a factor of two!” says project leader Wim Hermsen (SRON Netherlands Institute for Space Research/UvA). ‘And only then the X-ray emission is pulsed. Lucien Kuiper (SRON), who scrutinised the data from XMM-Newton , concluded that this strongly suggests that a temporary “hotspot” close to the pulsar’s magnetic pole switches on and off with the change of state. Most striking was that this metamorphosis takes place within seconds, after which the pulsar remains stable in its new state for a few hours. Why a pulsar should undergo such dramatic and unpredictable changes cannot be explained by current theories. It strongly suggests a quick change of the entire magnetosphere”. This unexpected chameleon-like behavior of the radio pulsar PSR B0943+10 bolsters fundamental research into the physical processes which occur in the extreme conditions which occur in the magnetosphere of pulsars, 45 years after the discovery of neutron stars. Wim Hermsen and his colleagues have been granted new observation time on XMM-Newton. By combining their X-ray observations with observations from a number of radio telescopes (Westerbork, GMRT and Lovell telescopes) the astronomers will also be able to simultaneously observe pulsar PSR B1822-09. In radio wavelengths PSR B1822-09 shows similar flips as PSR B0943+10. 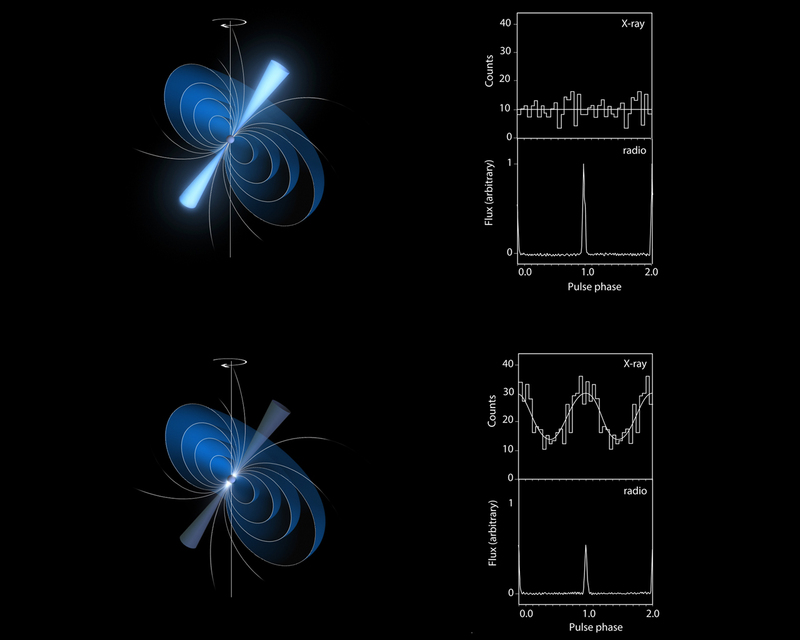 The results of this research “Synchronous X-ray and Radio Mode Switches: a Rapid Transformation of the Pulsar Magnetosphere” appeared in Science on January 25.